American Society of Anesthesiologists (ASA) Standards, Guidelines and Statements provide guidance to improve decision-making and promote beneficial outcomes for the practice of anesthesiology. This section incorporates the guidelines and standards essential to establish and maintain good anaesthesia practice and also covering the areas of safety and quality. The webcasts enables users to access a broader range of the College's excellent educational programme by providing open and free access to selected educational meetings, events and lectures online. The Association of Anaesthetists of Great Britain and Ireland (AAGBI) represents the medical and political views of over 10,500 anaesthetists in the United Kingdom and the Republic of Ireland. The Association of Anaesthetists of Great Britain and Ireland (AAGBI) provides lectures from major meetings, seminars and core topics events with simultaneous PowerPoint presentation slides. In a partnership with The World Federation of Societies of Anaesthesiologists (see below) The Association of Anaesthetists of Great Britain and Ireland (AAGBI) provides The Anaesthesia Tutorial of the Week, a weekly web-based tutorial on anaesthesiology. Updates in anaesthesia from the World Federation of Societies of Anaesthesiologists (WFSA). 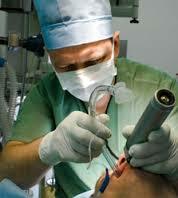 Canadian Anesthesiologists' Society 2013 Guidelines to the Practice of Anesthesia. Canadian Medical Association Clinical Practice Guidelines in Anesthesia. Statements, guidelines, policies and other documents from The Australian and New Zealand College of Anaesthetists (ANZCA). The Australian and New Zealand College of Anaesthetists (ANZCA) has endorsed a selection of guidelines developed by other organizations. The Australian and New Zealand College of Anaesthetists (ANZCA) books and reports, including Australasian Anaesthesia, a review in important topics produced every two years. Virtual Anaesthesia Textbook is an online textbook for anaesthesia providers and their support staff. The Association of Paediatric Anaesthetists of Great Britain and Ireland (APAGBI) promotes high standards in the specialty through education and research on anaesthesia for children. The Association of Paediatric Anaesthetists of Great Britain and Ireland (APAGBI) recommends a series of guidelines from other organizations. The Association of Paediatric Anaesthetists of Great Britain and Ireland (APAGBI) Virtual Patients are interactive cases on paediatric anaesthesiology. The Association of Cardiothoracic Anaesthetists aims to promote the highest standard of management and care for patients suffering from cardiothoracic disorders, and in particular those undergoing cardiac or thoracic surgery. The Geneva Foundation is an amazingly well organized directory of links organized by diseases and conditions mostly on gynecology and obstetrics. It also has an excellent link directory on free medical journals in all specialties, including Anesthesiology journals. BioMed Central is an STM (Science, Technology and Medicine) publisher of 251 open access, online, peer-reviewed journals, including journals in Anesthesiology. Medscape Reference is an outstanding free medical resource with vast content in all medical specialties including perioperative care articles. Medscape News is an outstanding free medical resource and includes articles reviews from the medical literature in anesthesiology. Medscape Education is an outstanding free medical resource and includes continuing medical education content in anesthesiology. Series of procedures in Anesthetic Techniques. The British Pain Society aims to produce contemporary guidance, supported by available evidence, on clinical and other pain matters. Australian and New Zealand College of Anaesthetists (ANZCA) Faculty of Pain Medicine Professional Documents including guidelines, policies and standards. Guidelines and Audit Implementation Network (GAIN) General Palliative Care Guidelines For The Management of Pain At The End Of Life. Guidelines and Audit Implementation Network (GAIN) summary of the General Palliative Care Guidelines For The Management of Pain At The End Of Life. Scottish Intercollegiate Guidelines Network (SIGN) guidelines on Control of Pain in Adults With Cancer.